I'm looking forward to digging through my pink scraps today to get ready for May. Pink and Rose will be the new colors this month. I hope you were able to take care of your yellows. 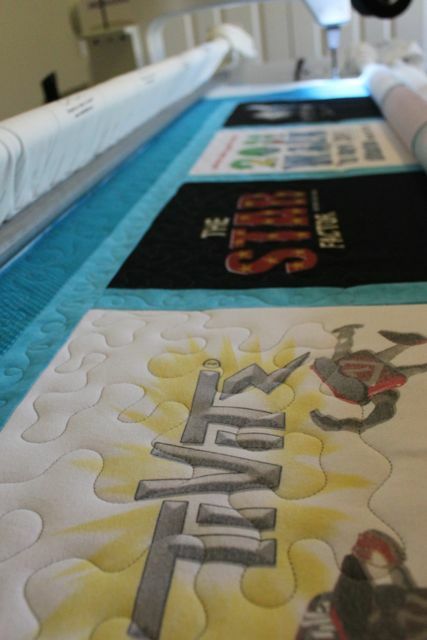 Binding time is quilting's reward for having finished something. Catherine's T-Shirt quilt is fresh off the quilting frame and ready for binding. I'm looking forward to slowing down with some calm slow stitching to finish everything off. Things are starting to wind down for the school year too, so finishing up is a theme right now. End of Course and AP exams are just around the corner, along with one more science fair leading us right into graduation. What a long strange year its been. I'll ponder all that while I'm sewing down the binding. I'm determined to get Katherine's graduation quilt finished today. I took a break when the bobbin ran out, thinking that I was about halfway done, but now that I look back at the flimsy photo, I think it is more like two thirds. 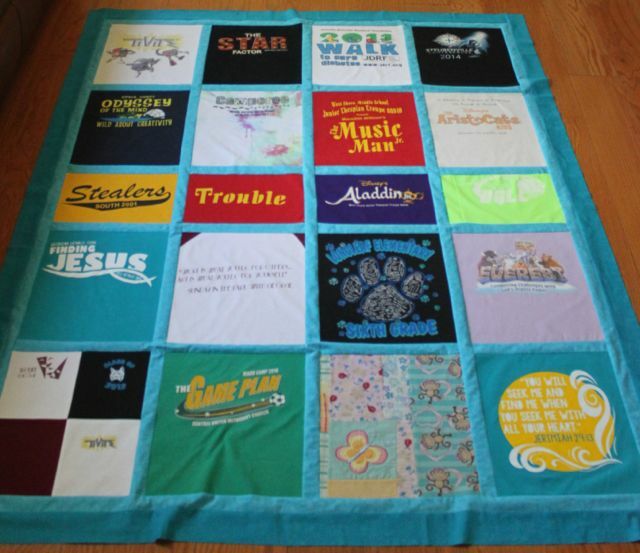 I'm right in the middle of the Finding Jesus shirt near the bottom left. Yay! I really like the butterfly and monkey block on the bottom row. It is half pillowcase and half PJ pants. I'm sure they must both hold fond memories. I really like the flannel that I found for the back. 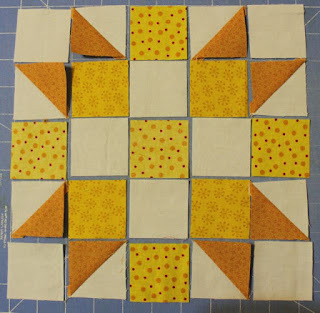 I got not quite enough on purpose so that I could work in a little bit of the border fabric. I even have enough of the border and sashing fabrics to make a coordinating pillowcase. Such a nice finishing touch, don't you think? Choosing a quilting thread is always a trick on t-shirt quilts because there is so much contrast in the shirts. I tried many shades of blue and teal before reverting back to my default of grey. Not too dark on the white shirts or too light on the dark shirts. 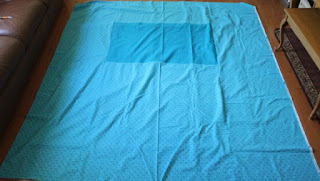 I used teal for the back though, and it is virtually invisible. I'm doing some loops in the background, but sticking to a less dense meander in the shirts to avoid detracting from the design. Also it makes it easier to avoid the heavily painted areas of some of the shirts. It goes quickly, which is a bonus. When I went to pull the quilt photos from the memory card, there were more fire pictures. This is our backyard fence -- the same one that blew down in the hurricane. This was the view from upstairs. Its our neighbors pool screen on the right. 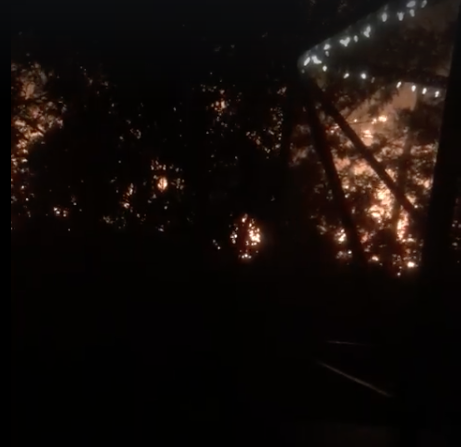 We were all really lucky the wind wasn't blowing the other way. There is still a thin line of unburned buffer foliage separating us from the burn zone. I'm thinking that thinning out vegetation might come up on the list after the quilt is done. I graded 560 essays last week between the last AP test and the final practice AP test! I was so tempted to save them for the weekend, but I knew that the kids would want to see Infinity Wars and so I powered through until 11:30 on Thursday night. I'm so glad that I did now that it is done. Best of all, they were the last essays of the year! Well, at least until I go to AP reading in June when there will be thousands of essays to grade. Having procrastinated enough, I'll go wind one more bobbin and finish this quilt off. If I can get the binding on this afternoon then I can have a bit of a movie marathon while sewing binding. Sounds like a lovely way to spend a Sunday evening. My little guys have their Biology EOC tomorrow, so We'll have to take a breather before shifting into less stressful learning activities. They won't want to do anything at all ever again, so we will have to work together to find a nice compromise. April is almost over. 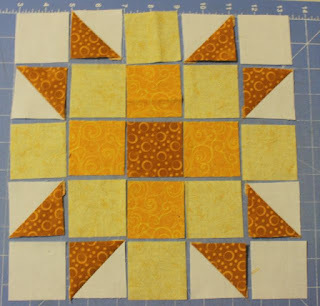 I hope that you are all making better progress on your yellow scraps than I am. The month has zoomed by! I'm not sure that May or June will be much better, but I have high hopes for a calm July. Until then, thanks for sharing all your projects, it is much more fun to read than the 320 essays I just finished yesterday. 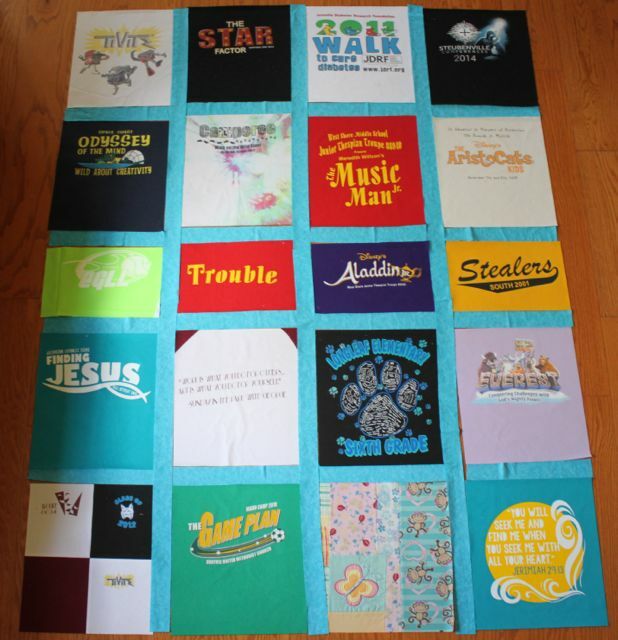 Today is actually unscheduled, which means I'm off to finish this t-shirt quilt in time for graduation. Borders are next on the list. While I was in Orlando this weekend for Academic Team, this is what was going on at home. 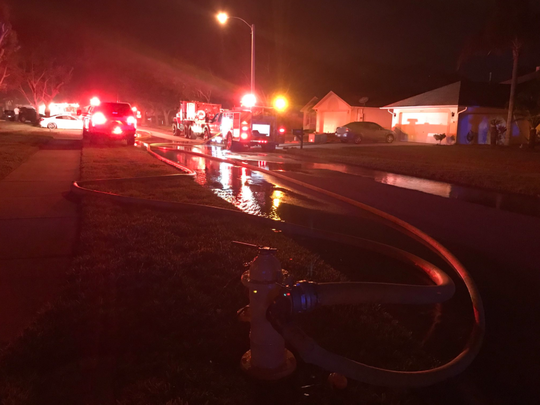 Fortunately, nobody was hurt, and the damage was minimal. 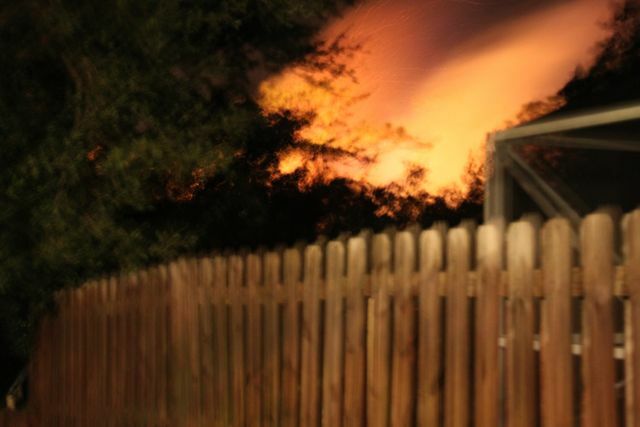 Our house is fine, but it got way too close to some of our neighbors. The ringer on my phone was still off from the awards ceremony, so I didn't know anything about it until I woke up this morning. 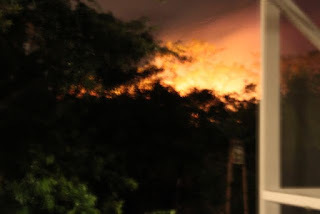 Anna had just gotten back from babysitting and was up in her room doing some homework when she saw flames from her bedroom window. She woke everyone in our house up and the kids all went around warning neighbors. It got closest to her friend Allie's house, three doors down from us. Allie was just getting home from prom while her dad was in the backyard spraying everything down with a garden hose. Kurt loaded all the photo albums and computers up into the car and sent the kids off to WaWa to get slushies while firefighters battled the blaze. It was a long night to say the least. So glad it wasn't worse! April is zooming by. It always seems to be one of the busiest months. Year end tests are just around the corner and final competitions for everything are in full swing. I am off at Academic Team this weekend. Sadly, my team has lost, so we have today to hang out around the resort before the awards banquet tonight. We have been hitting the theme parks hard the last two days, so a bit of a calm day sounds lovely to me. 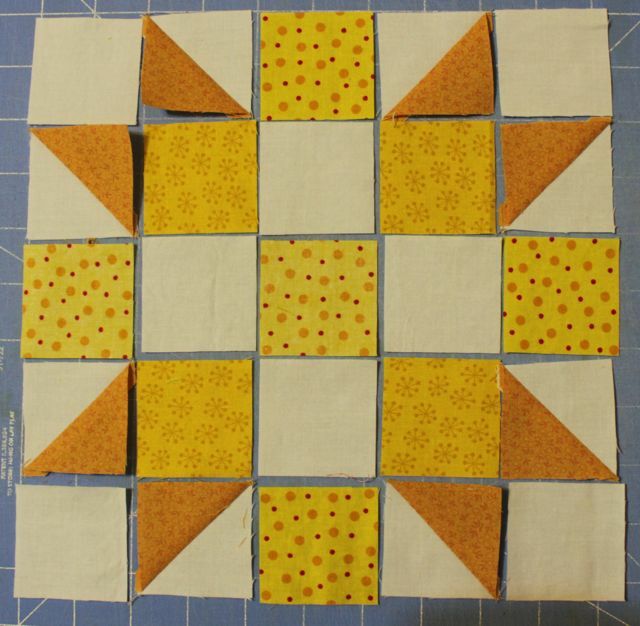 I finally got around to PDFing the block for the squared away sampler. Sorry for the delay. I'm such a slacker! Yesterday we painted the walls of the garage and today we painted the floor and I ache in places I didn't know that I had. Go to the RSC 18 tab for a complete list of links. The original directions are posted here. The PDF version is here. Now I'm off to make some cupcakes that I promised for the last Academic Team practice tomorrow night. Then I have to find that test I brought home to grade this weekend. I hadn't thought about since Friday afternoon, but I'm sure its hiding somewhere. One month and two days until graduation. Not that anyone is counting down of course. 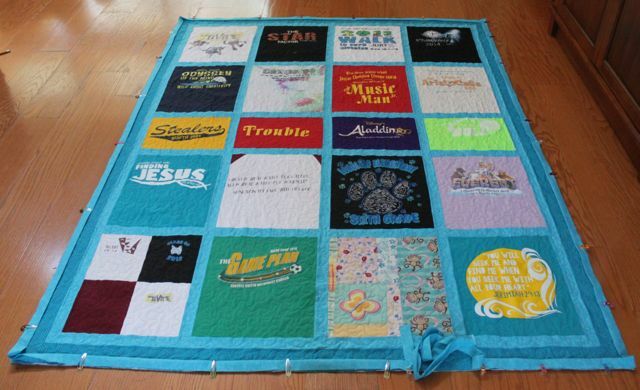 I once made a quilt for Mom in the Sister's Choice Pattern. It reminds me a lot of this month's block. The nice thing about making three of each block is that is gives you a chance to play around with the colors. Different placement gives each block a unique look. I completely neglected to make the PDF instructions from Mari's post last week. Its a good thing that I made all the blocks in January or I would have forgotten that too! I'll update the links soon though. Kurt has gone to drive Ryan to the ACT. He has prom tonight and Sydney is planning a sleepover. I have a graduation quilt to finish, but first I need to go and finish painting the garage. We are redoing the floor and I want to do the walls first in case I drip. Who am I kidding, of course I'm going to drip. Its a garage! Last bit of exciting news. The girls Lacrosse team made it to the district tournament. We only won two games this season, but they were both against district teams. So there is one more game to go and the season will be done. Spring can get a bit out of hand here, but hopefully things will start to wind down soon. 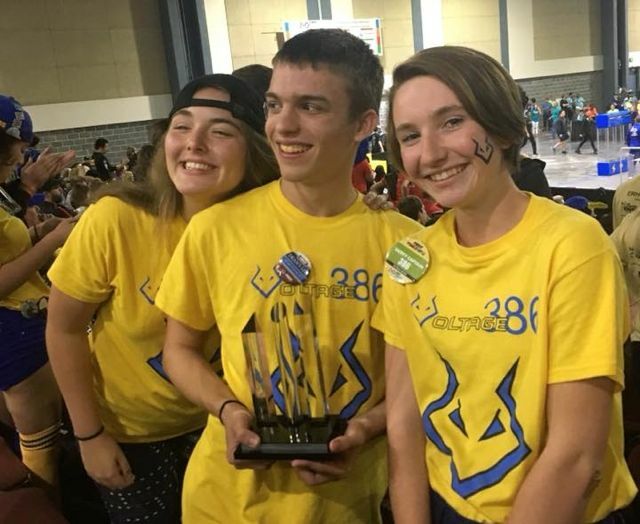 Robotics is done, lacrosse will be done soon. Just lots of tests and a few more random competitions to get through before graduation in 31 days. Not that anyone is counting of course. It's been a long week! 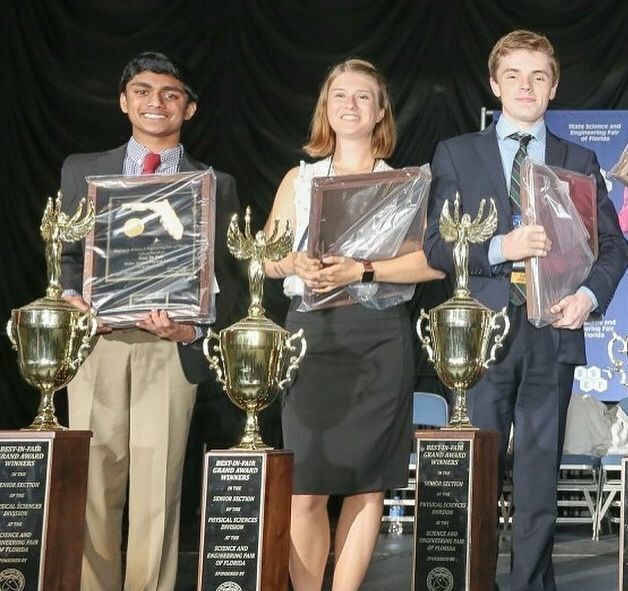 State science fair was finishing up just as spring break was starting. That was when Anna won best of show. She was a little surprised. There are actually 8 "Best of Show" awards for the entire state, so the odds are pretty good if you make it to first. She has never finished above second at state though, so she was really thrilled. Just as the girls got home from that, Kurt and I hopped off for a quick grown up trip to Jamaica. 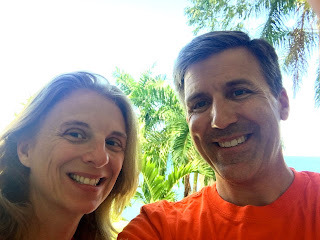 Three days of all inclusive relaxation with lots of food and adult beverages. So nice! Kurt's dad came to stay with the kids and they had lots of nice family time together. 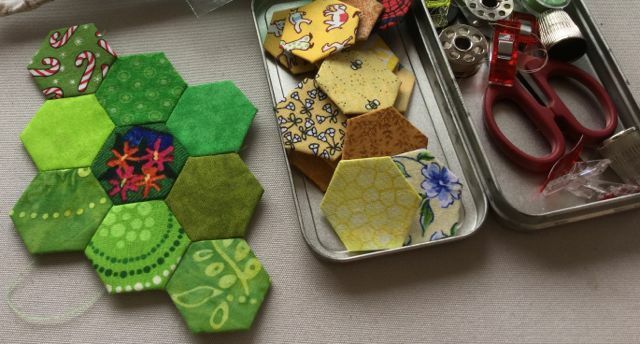 I spent some time hanging out on the balcony of our room sewing up hexies. Lots of prep work happened during the traveling part. Even on bumpy and curvy roads, it is still easy enough to baste hexies. I even thought far enough ahead to bring along some yellow for April! Just as we were landing, Ryan was finishing up his robotics tournament. 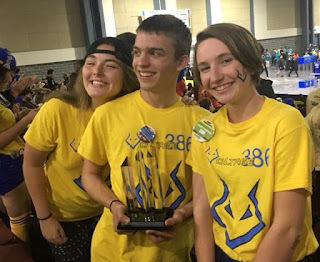 His team didn't get a bid to worlds this year, but they did win the control award. Ryan was pretty happy about that because he is the head of software which is integral for robot control. They even let him bring the trophy home for the break! 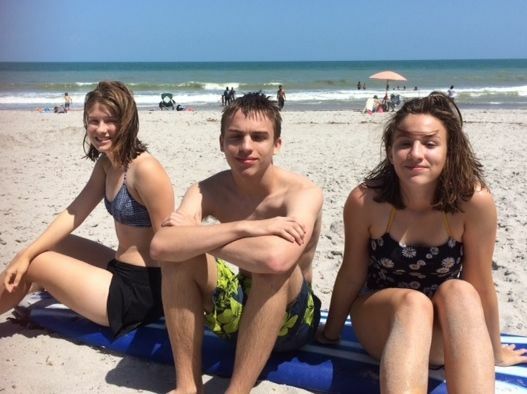 Then once we were all back together again, we took a quick trip to the beach. It is so close, and yet we just don't go all that often. Here they are taking a break from the waves after somehow loosing all the fins on the surfboard. This morning we are off on one last college visit. It will be decision time for Anna soon. I think she'll finally make a final call after this. Just 31 school days until graduation. Hard to believe how quickly it has all happened. Back on the sewing front, I am looking forward to a month of sunshine and happiness. 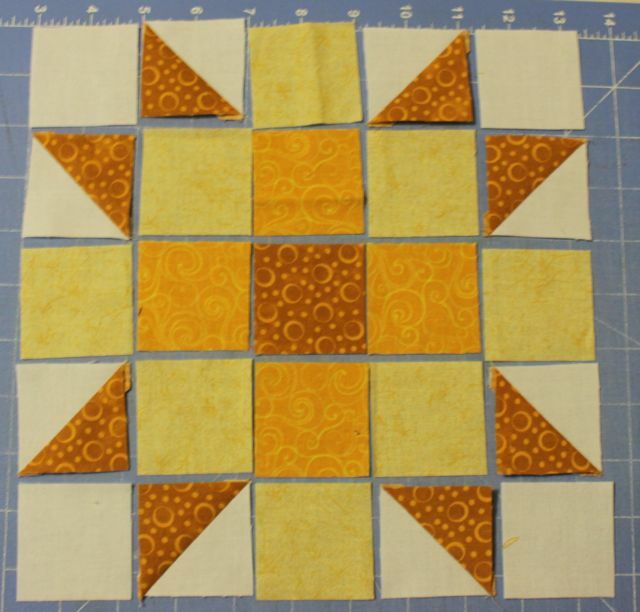 Yellow is such a great color to add light to your quilt. It is easy to go overboard, but in small doses, I have really become a fan. 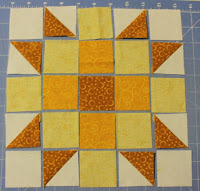 I'll get my sewing room back on Sunday so more yellow scraps are sure to come out to play.